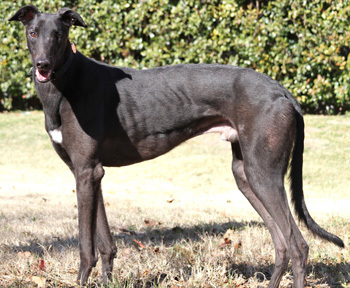 Luigi, aka Gable Luigi, is a handsome 3½-year-old black male born June 9, 2007. 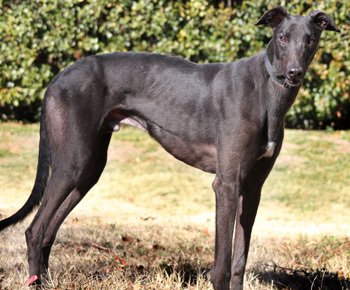 His sire is Gable Oscar, making his grandsire the late famous Gable Dodge, and his dam is Irish bred Clare Lottie. Ghee and Luigi have the same dam, but different sires. Luigi and Salami share the same sire, but different dams. There are 16 races to Luigi's credit on Greyhound-data.com, staring March 20, 2009, at Gulf Greyhound Park in LaMarque, TX, and ending there on August 14, 2010. This stunning boy is ready to find his forever home, hopefully with a couch, but the couch is not mandantory! Luigi is cat trainable, and he will be tested with small animals at a later time. Luigi is one of the easiest fosters we've had. He crates well when we are not home and sleeps at night in our room on an elevated dog bed. He loves his food as well as his stuffies. 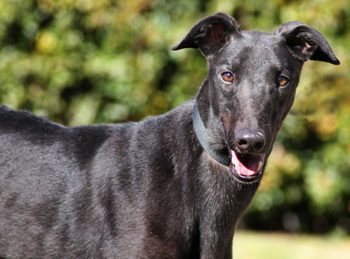 He is one of the more high energy greyhounds and loves to do his laps in the yard each evening. That usually pretty much wears him out until it's time to unload the toy box and play with anything that will squeak! Luigi loves people and is very affectionate and is quick to hop to the front of the line for attention. He gets along well with my other two greyhounds. Luigi is easily correctable and understands the word "no" very well. He is a laid back curious boy but is sensitive to loud noises and new things. Luigi is a quick learner and would make a great companion for whomever adopts him.